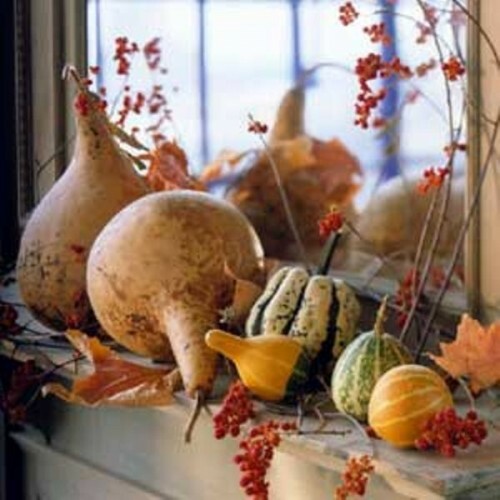 The most romantic and melancholically sweet season has come. 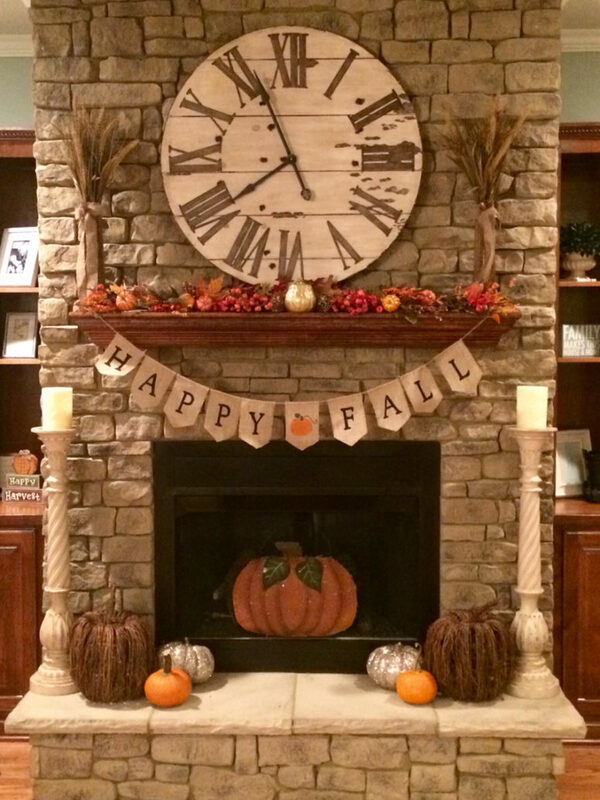 Decorate your mantel and fireplace according to fall’s spirit! 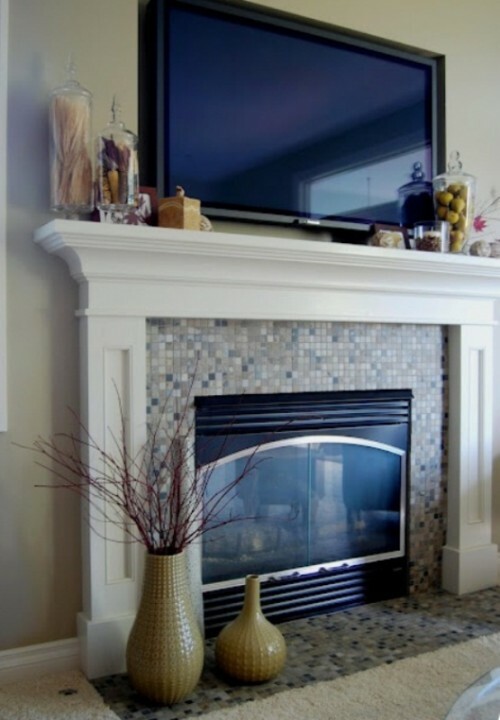 There is plenty of ideas that you can easily realize without wasting much money. 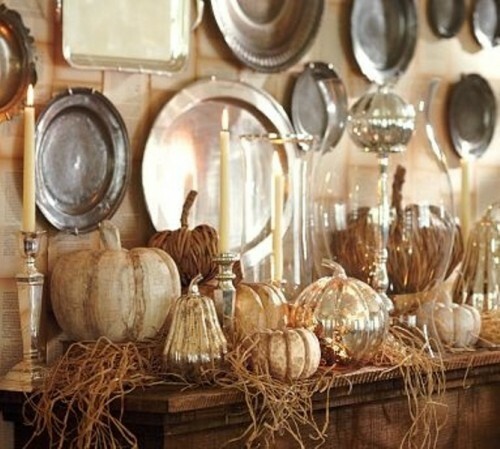 The simplest idea is to use fruit and vegetables for decoration, faux are better because they won’t rot, take nuts and chestnuts also. 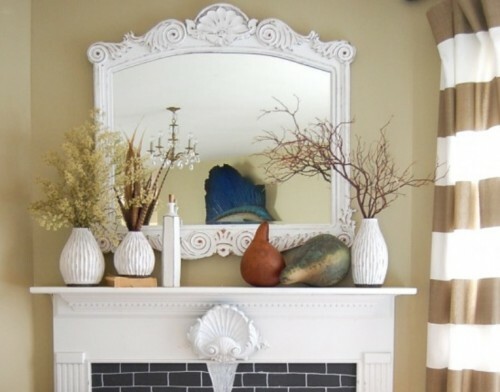 Add a wreath or a vintage frame above – that would give a vintage touch, mirrors and vintage portraits will do, too. 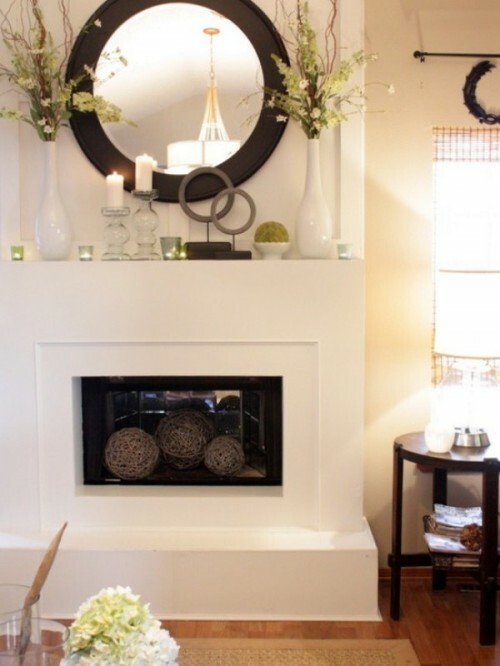 Candles, flowers and vases are a classical decoration and will always make your mantelpiece cool, no matter what it looks like. 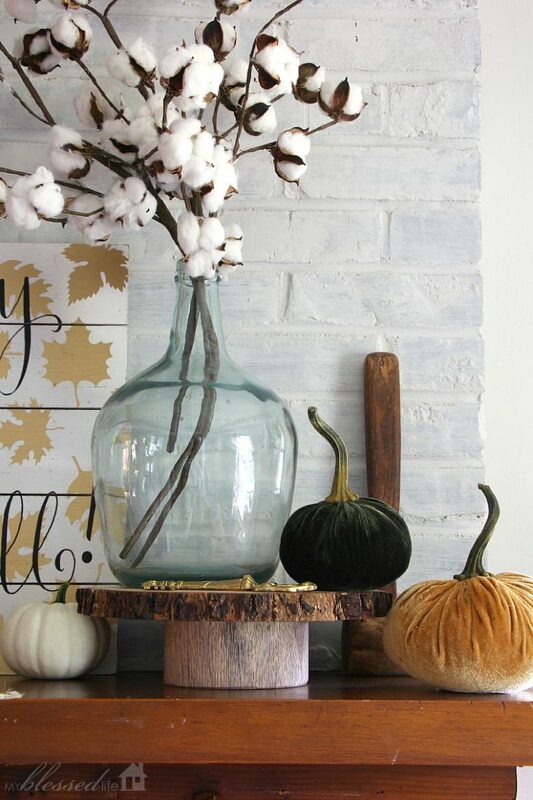 Don’t forget about autumn leaves, spikes and moss – put them into vases and bowls and enjoy! 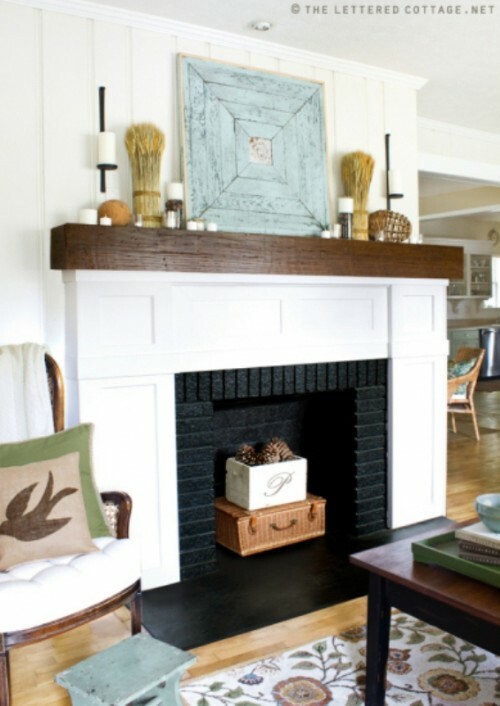 Chalkboard accents is an another great way to add a personal, creative touch to a mantel's decor. 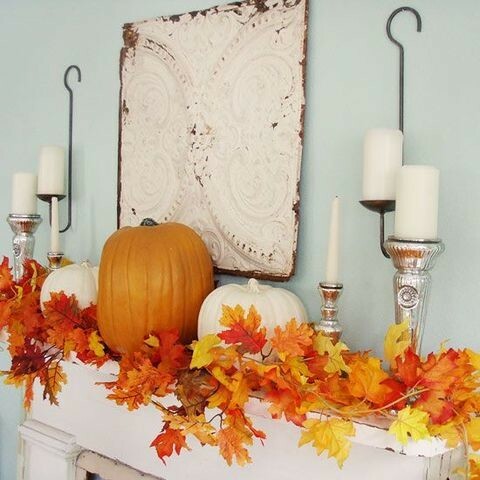 For affordable yet glam Fall decor you don't anything besides simple pumpkins, candlesticks and twigs. 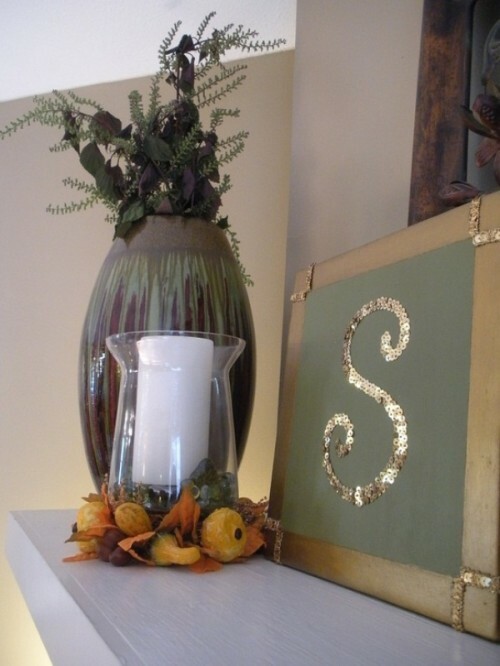 You just need some shiny metallic spray paint to turn them into even more beatufiul things. 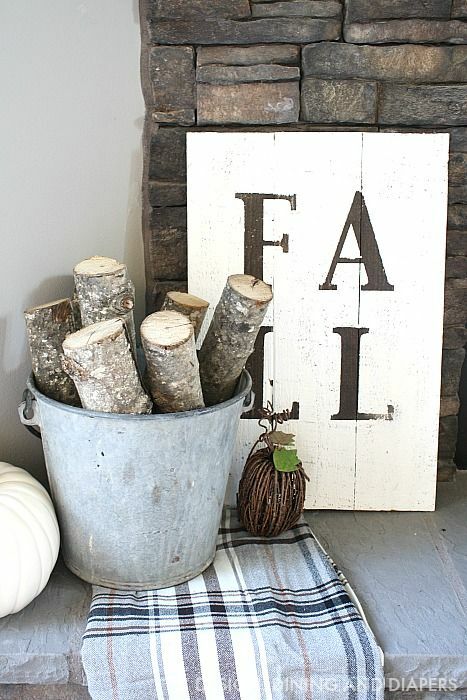 A vintage bucket with a bunch of cut tree branches is a great addition to any fall arrangement. 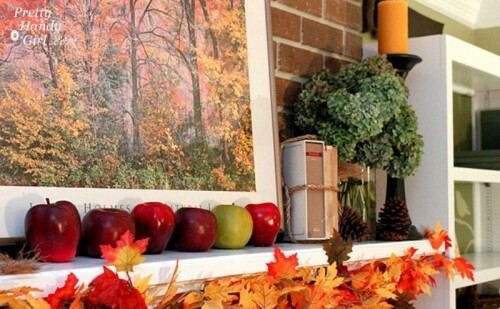 Besides standard fall decorations you could also hang beautiful photos of this time of the year from different countries. 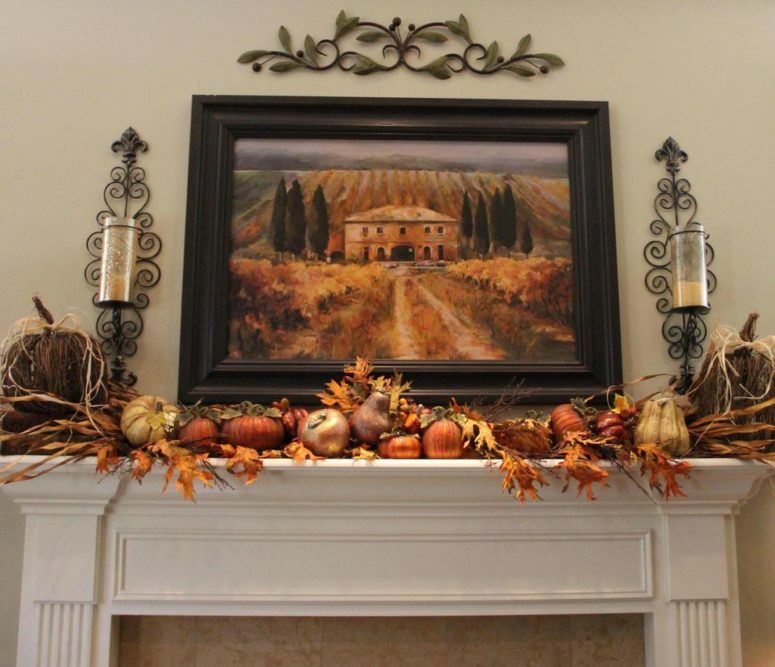 For example, a photo of Toscana's fields. 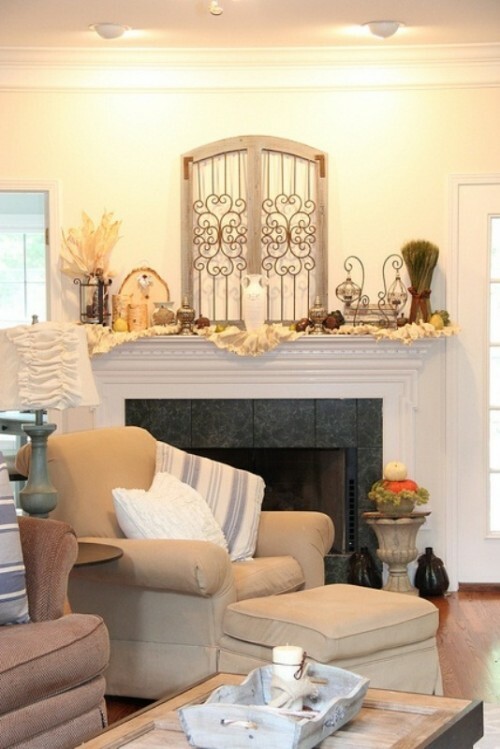 Do you have an old wrought iron window? 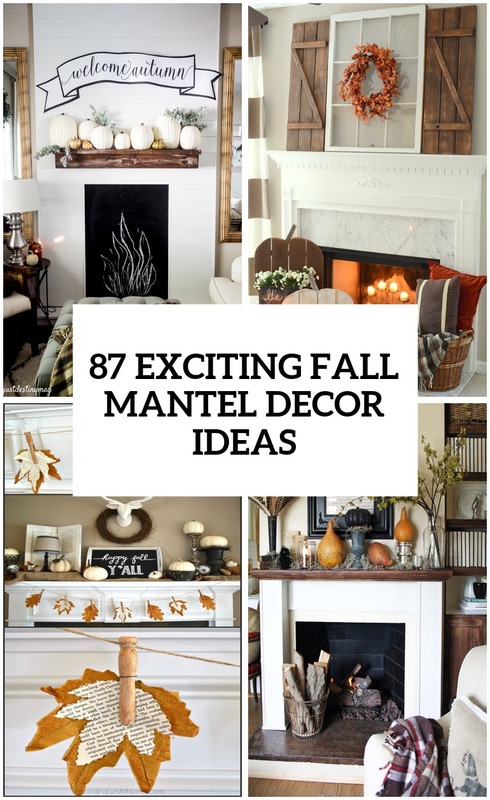 If so, then hang a fall's wreath on it and put it on your mantel. 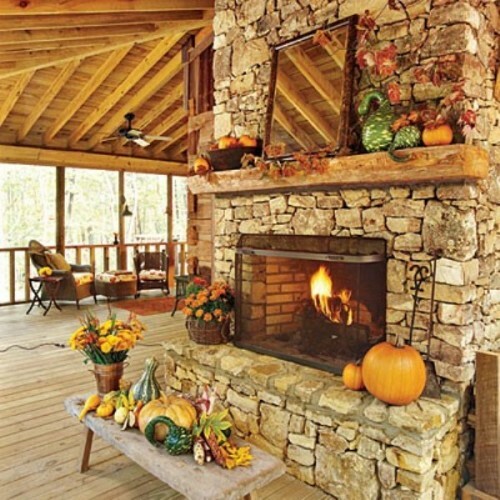 They'd make a gorgeous display. 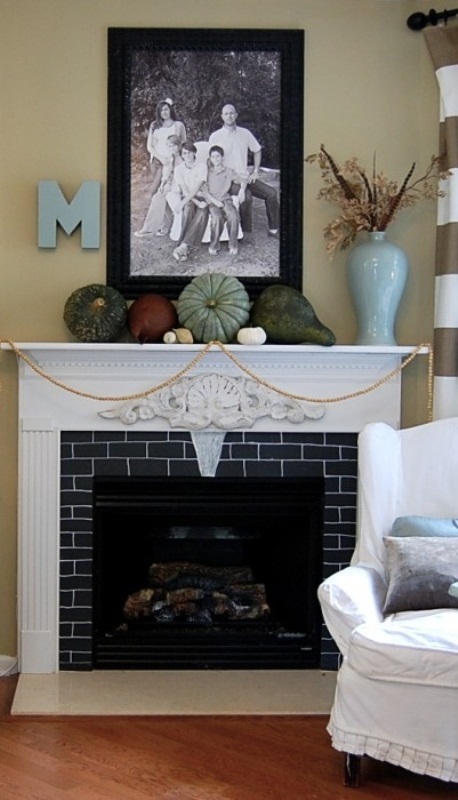 Twigs are great to adorn your mantel. 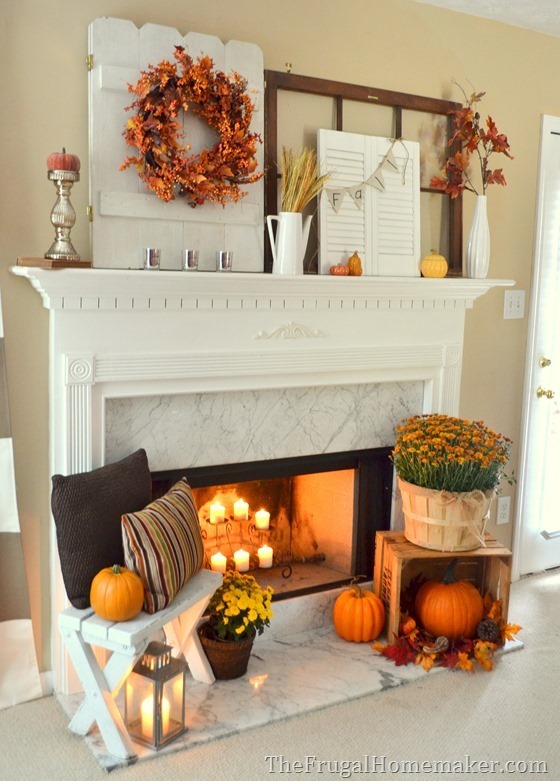 You can gather them with kids and hang with them later. 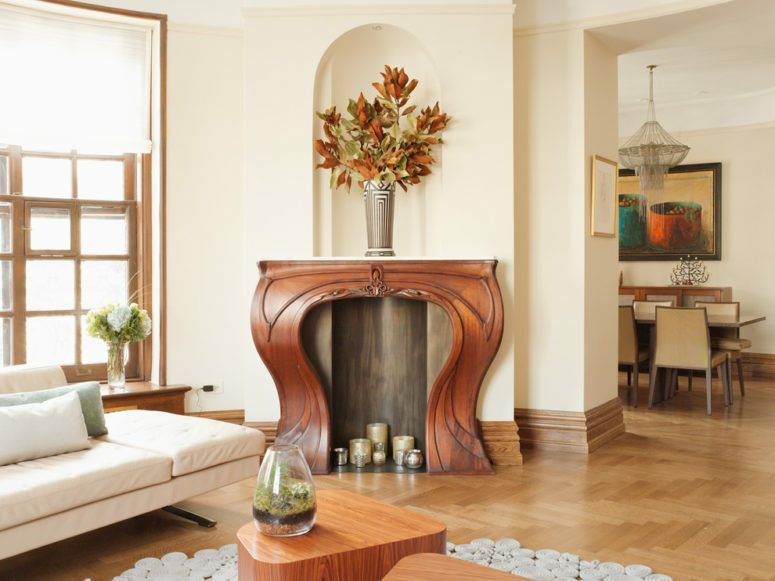 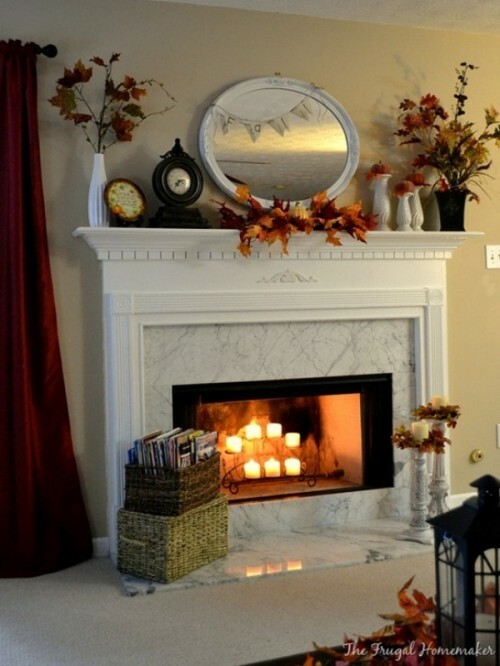 Even such gorgeous, sculptural Art Nouveau mantel could benefit from a little bit of seasonal decor. 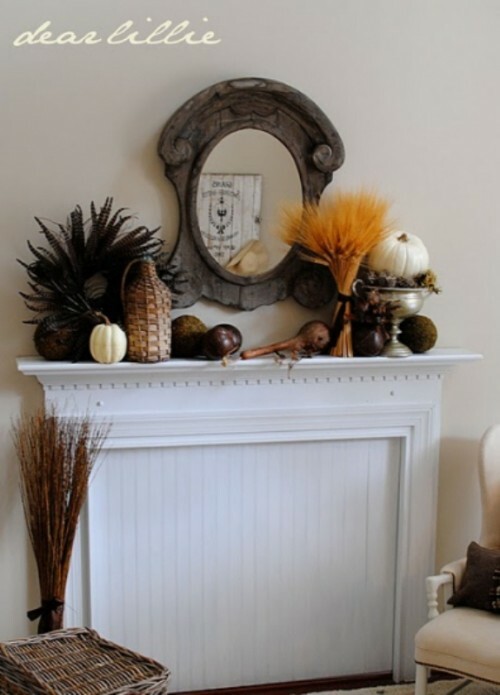 For Halloween you can choose a chic black and white theme and make decorations according to it. 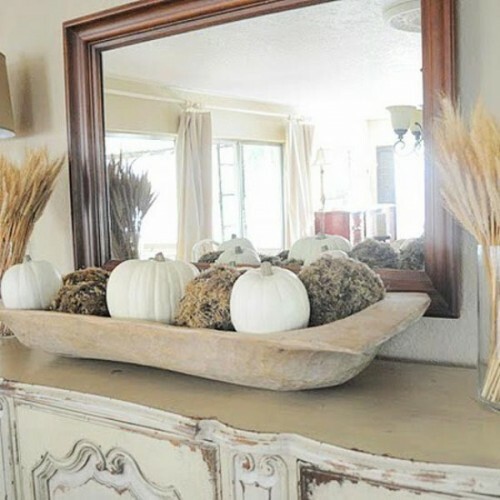 You can paint pumpkins in white while some tin cans and sticks in black. 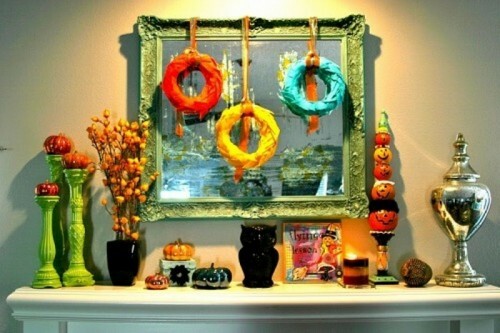 Together they'd look totally awesome! 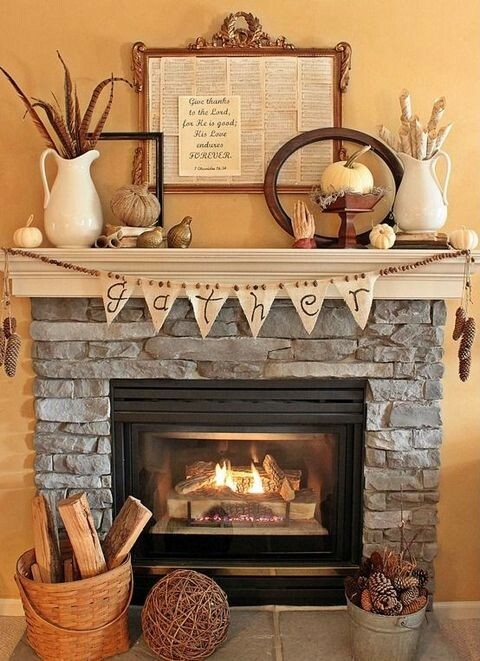 A burlap bunting is always a great, rustic addition to a fireplace's decor. 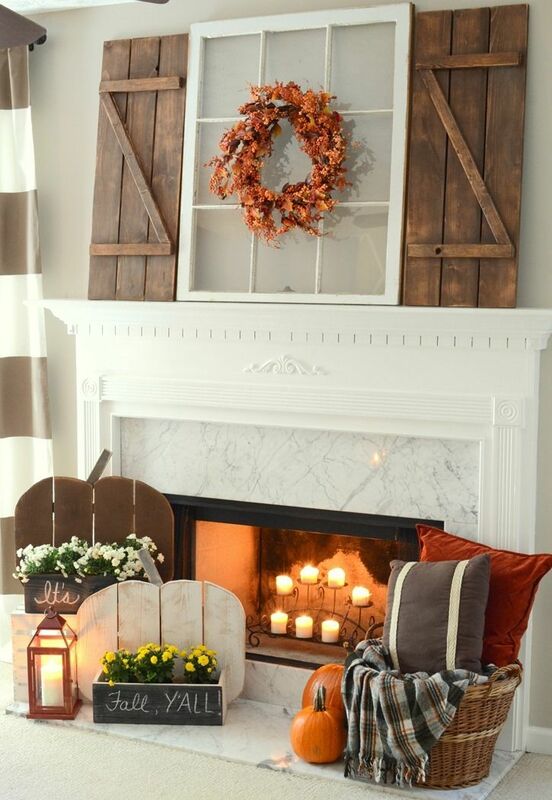 Vintage shutters and doors are perfect things to hang a wreath or a bunting on and make them a part of fall mantel decor. 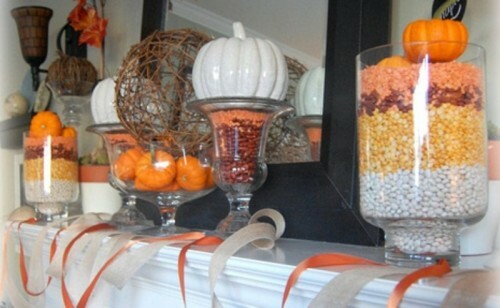 Layering things is a good way to make your festive arrangement more interesting and creative. 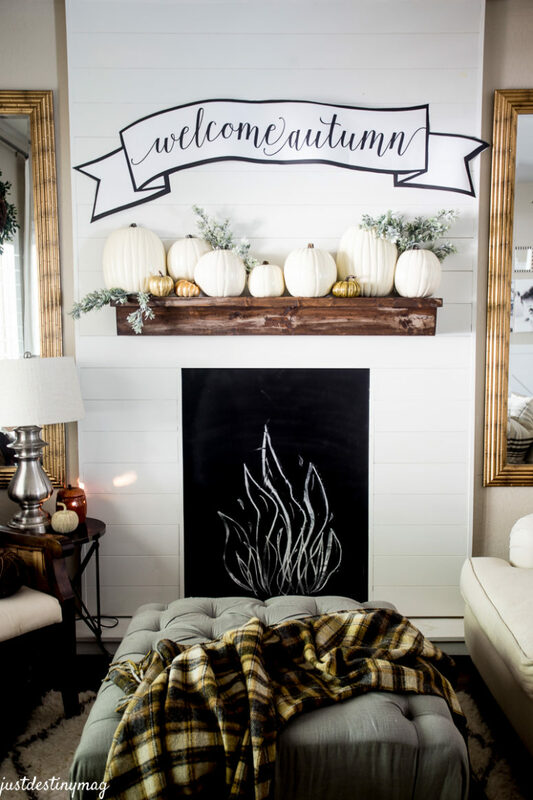 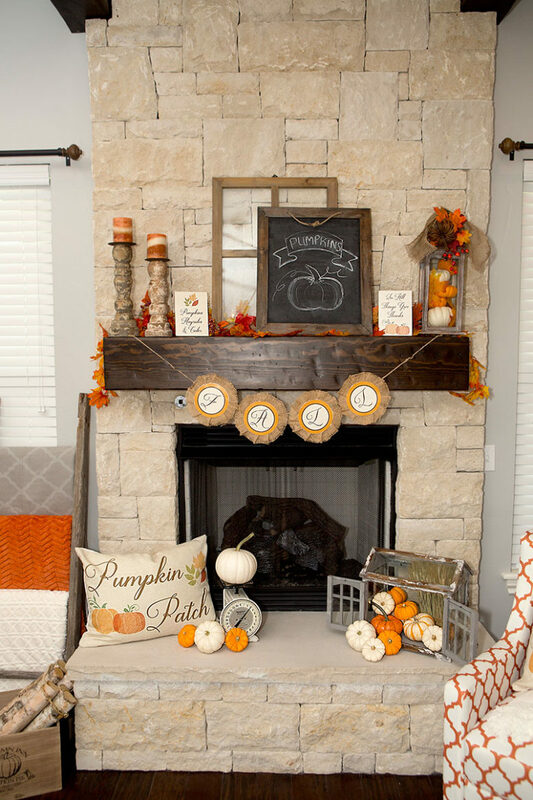 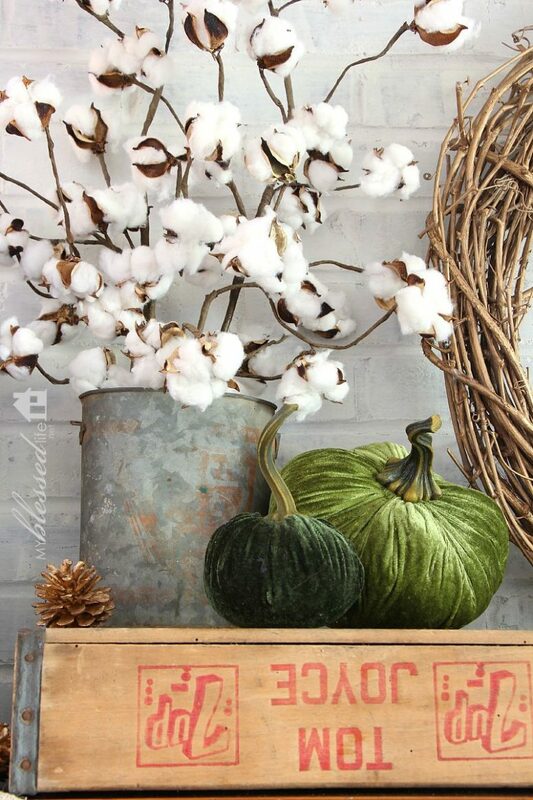 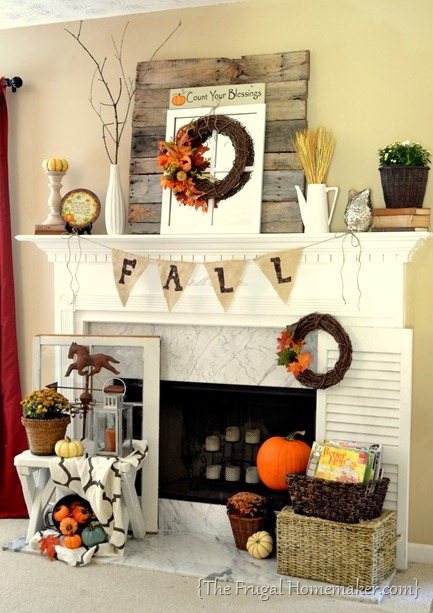 This is a great example of farmhouse style fall mantel decor with tiny pumpkins and cool vintage finds. 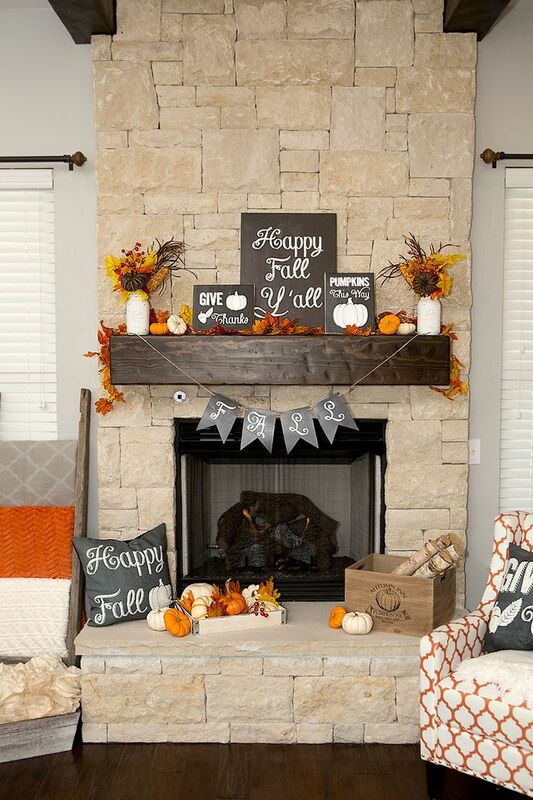 A banner could become a cool addition to your fall decor. 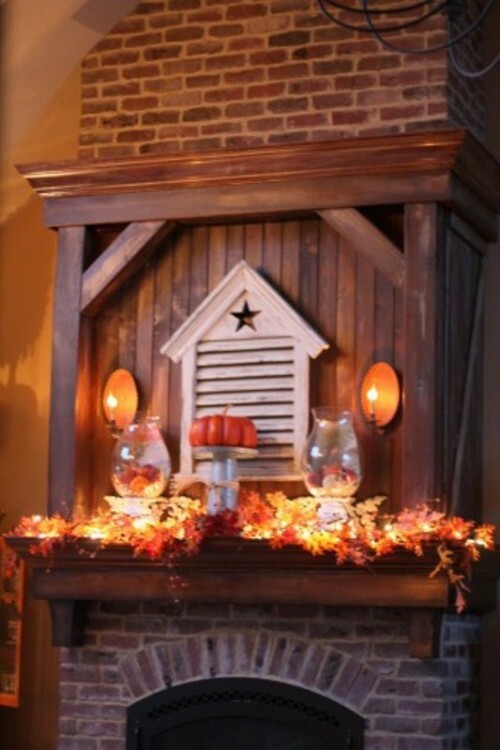 The one here, won't be hard to make! 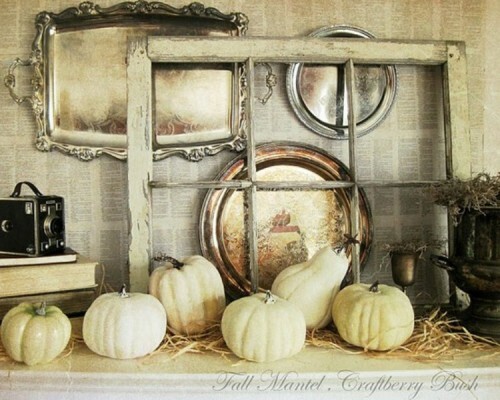 Rustic wood and galvanize metal could always add a rustic touch to your arrangement. 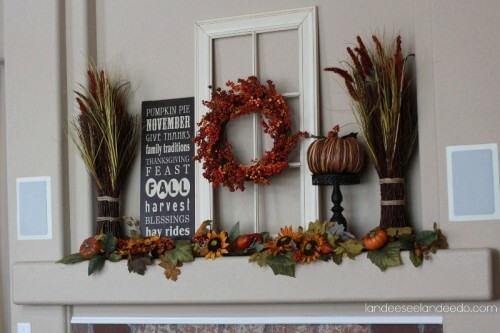 Such arrangments would work great for farmhouse interiors. 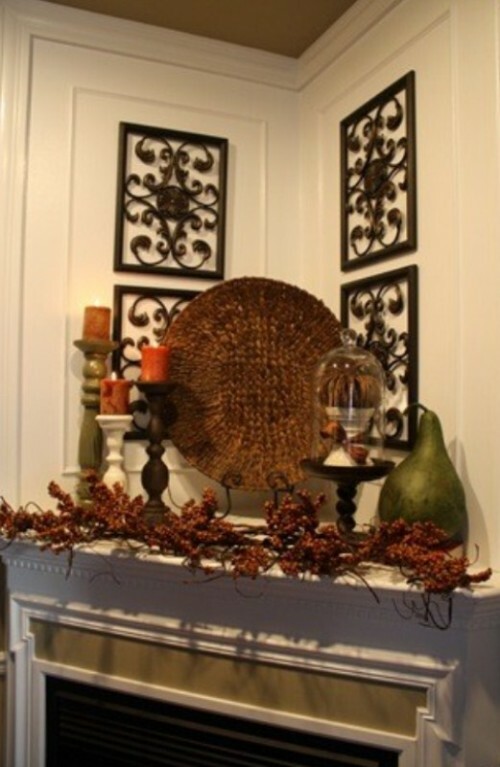 If you don't have a mantel even a single shelf could be turned in one with some creativity. 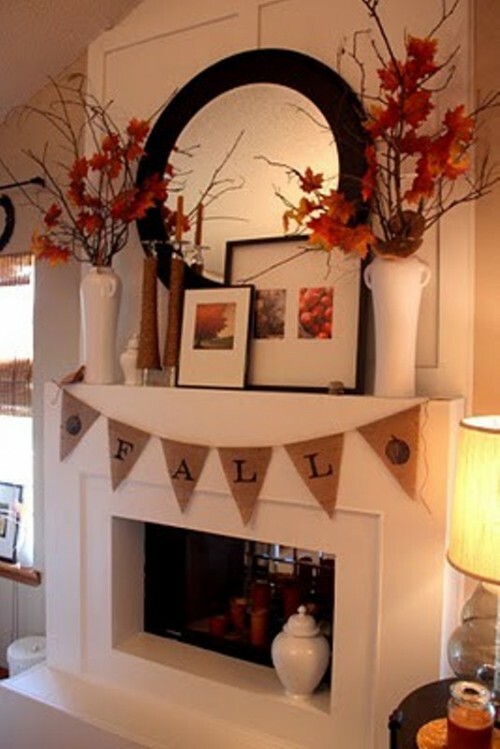 Fall leaf banner made of book pages from old books would be a great addition to fall's mantel decor. 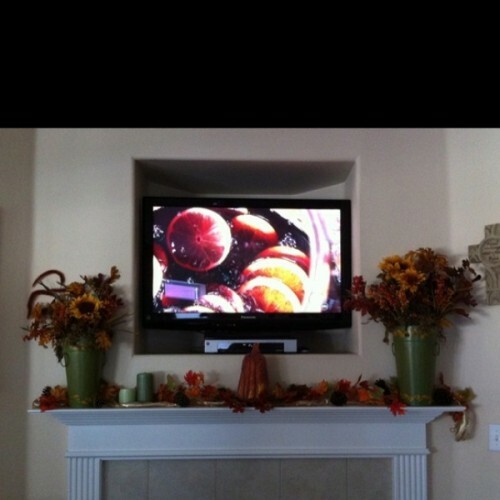 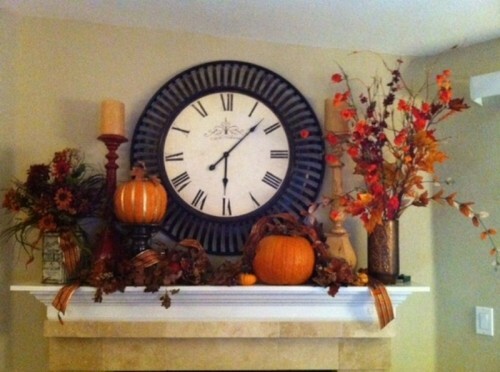 Single line of pumpkins and a wheat wreath is an easy and quick way to get yourself a simple fall display on a mantel. 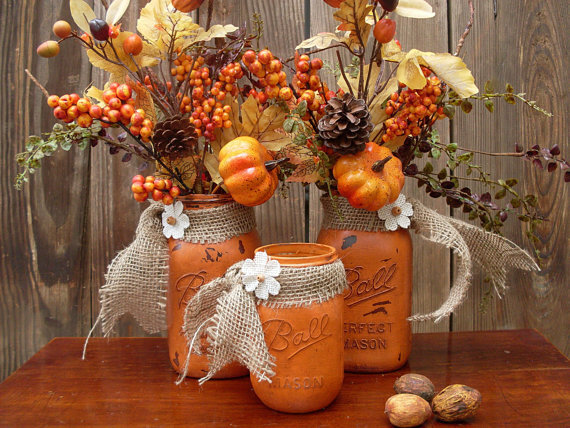 Here is a great idea to turn mason jars into rustic vases for fall bouquets. 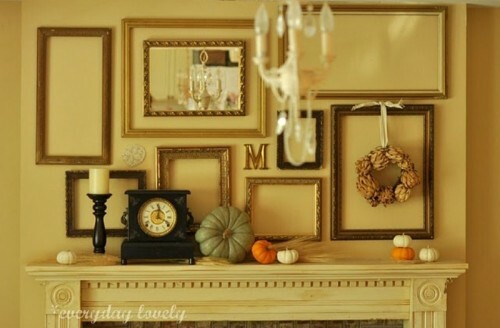 Such arrangement would look gorgeous on a mantel. 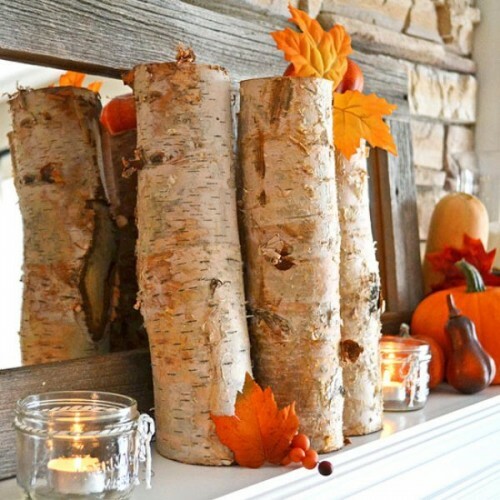 Birch bark adds rustic appeal to any arrangement so several birch stumps would look great on any mantel, especially combined with seasonal things like tiny pumpkins and colorful leaves. 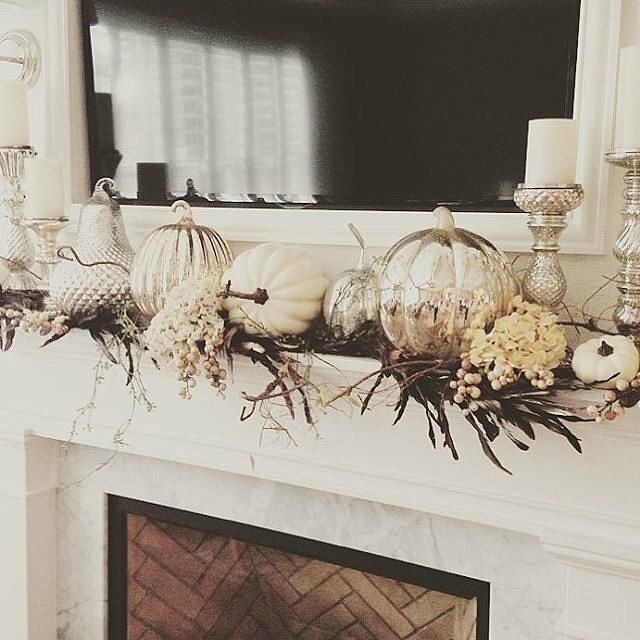 Spice up your mantel with metallic pumpkins. 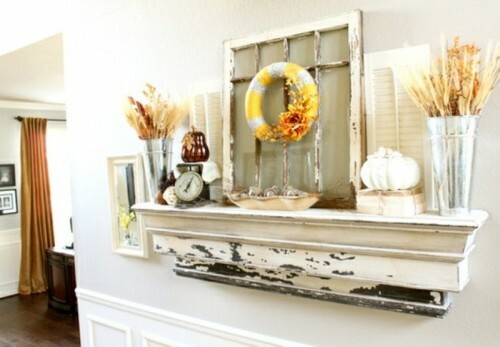 Spray painted, they definitely would add some drama to any arrangement. 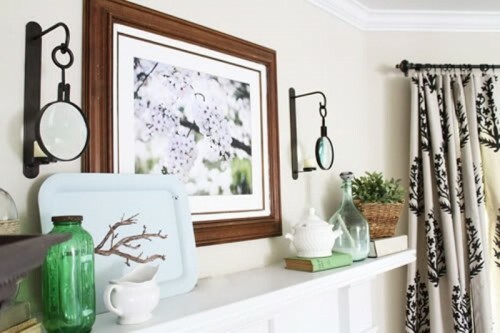 Do you have a bunch of cool vases? 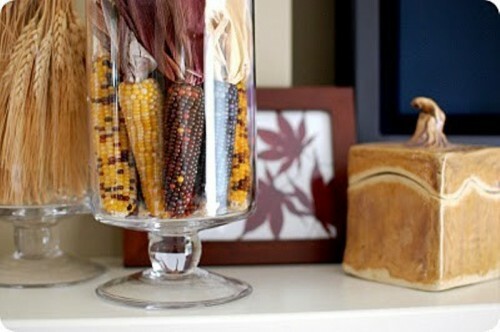 Stuff them with indian corn and wheat for a simple and quick mantel decor. 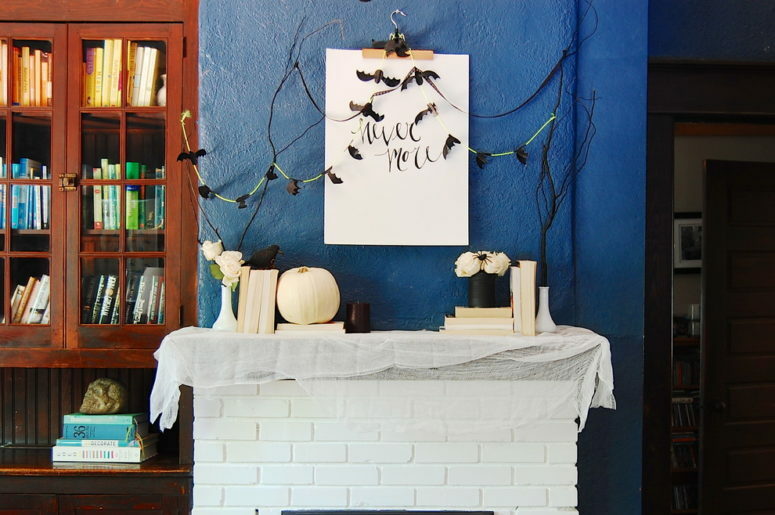 For a more personal touch, add a DIY faux pumpkin. 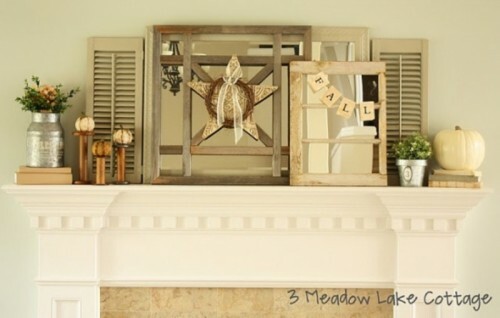 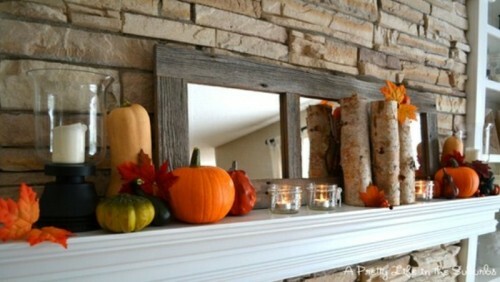 If you don't have a mantel then a weathered wood shelf with trim would work as a charm as your fall display. 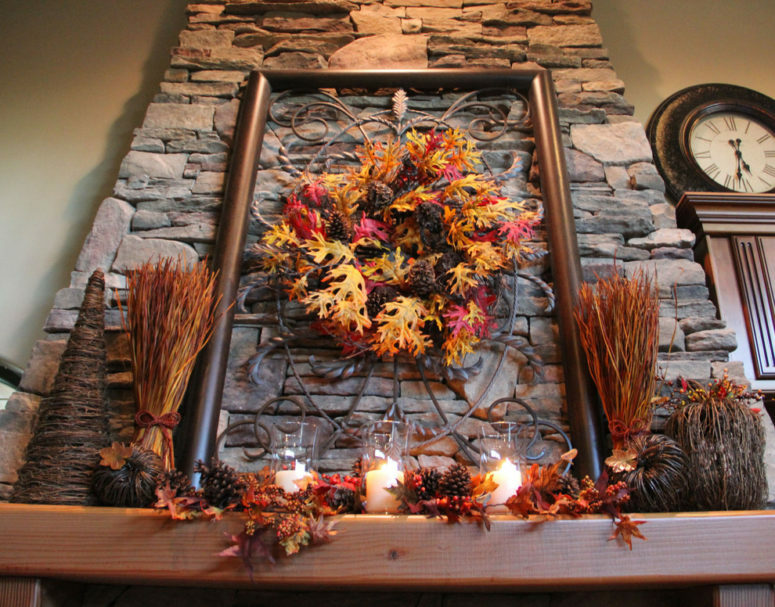 A tree made of backyard sticks with dried leaves adds some height and dimension to any fall mantel. 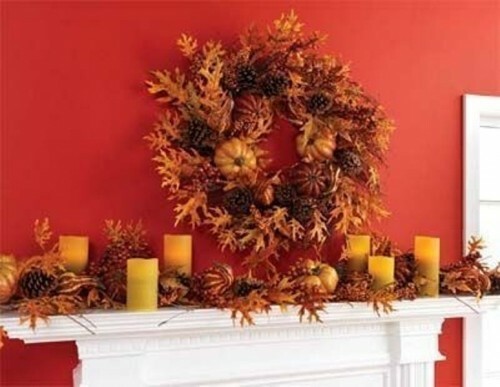 Vibrant oranges, yellows and reds can take you all the way through fall and Thanksgiving. 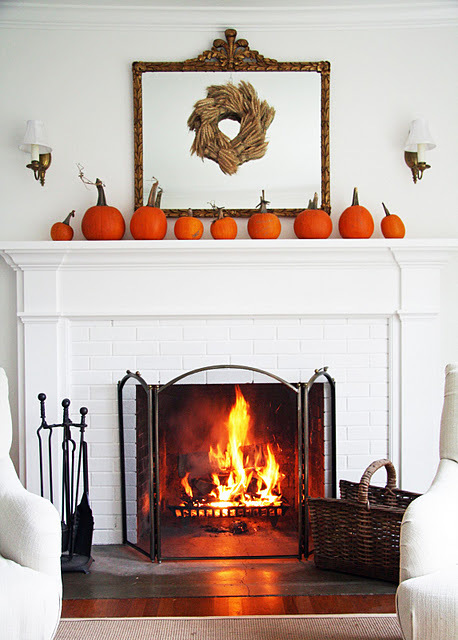 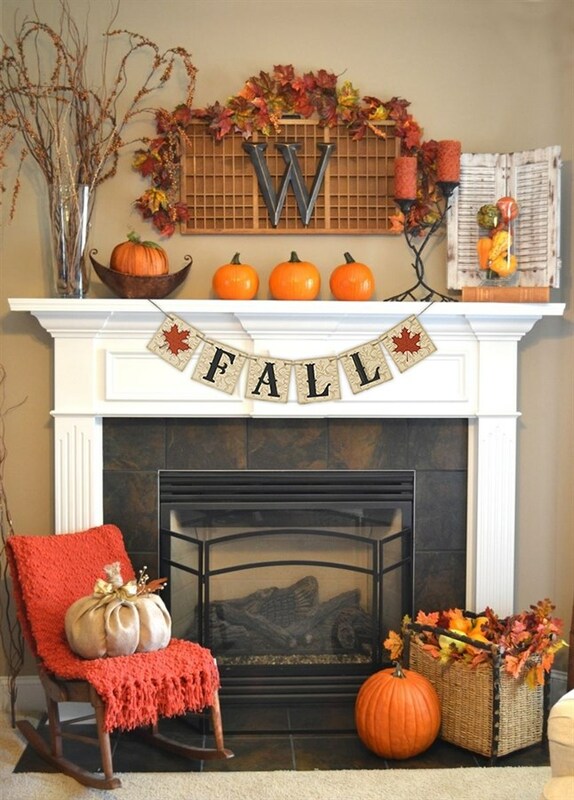 Mix pumpkins, candles, twigs and fall blooms for a beautiful fall mantel. 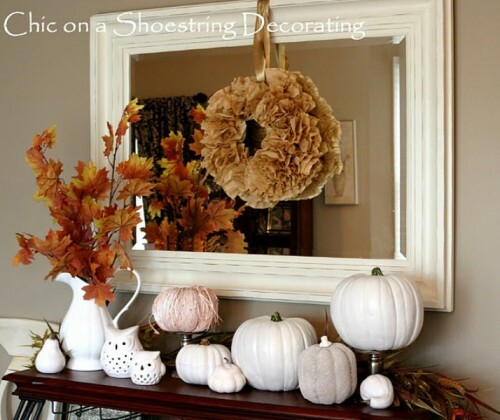 An assortment of gourds and and pumpkins is perfect idea for a simple mantel display. 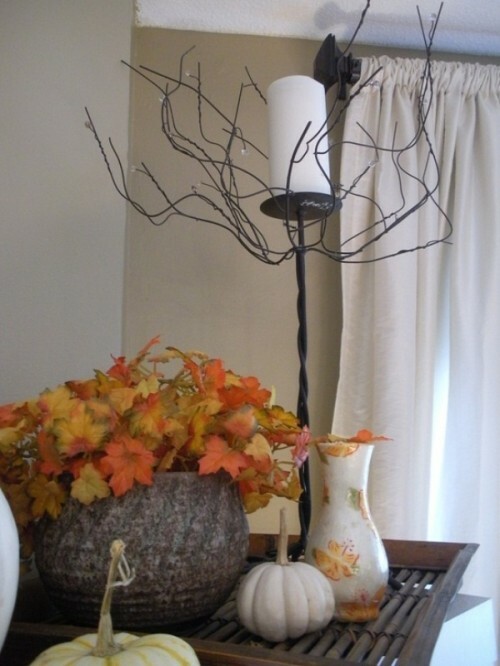 Several branches with leaves provide extra texture to it. 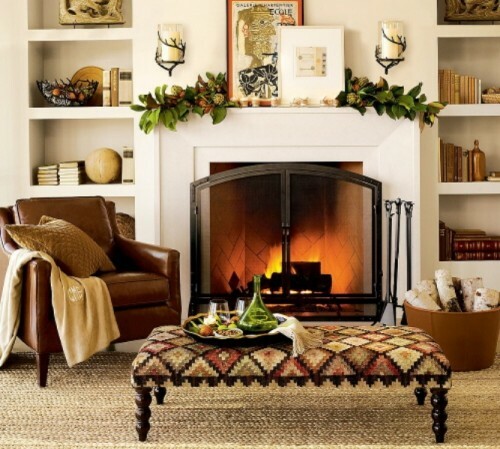 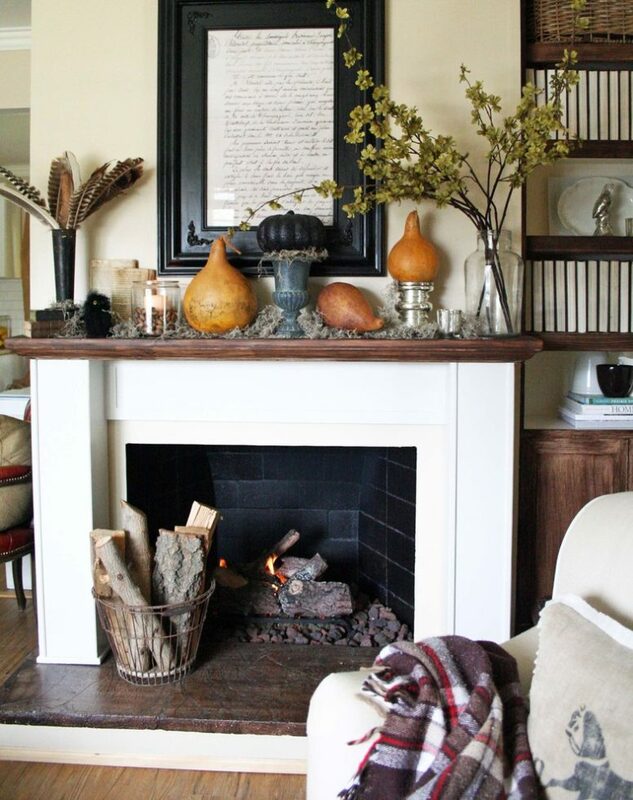 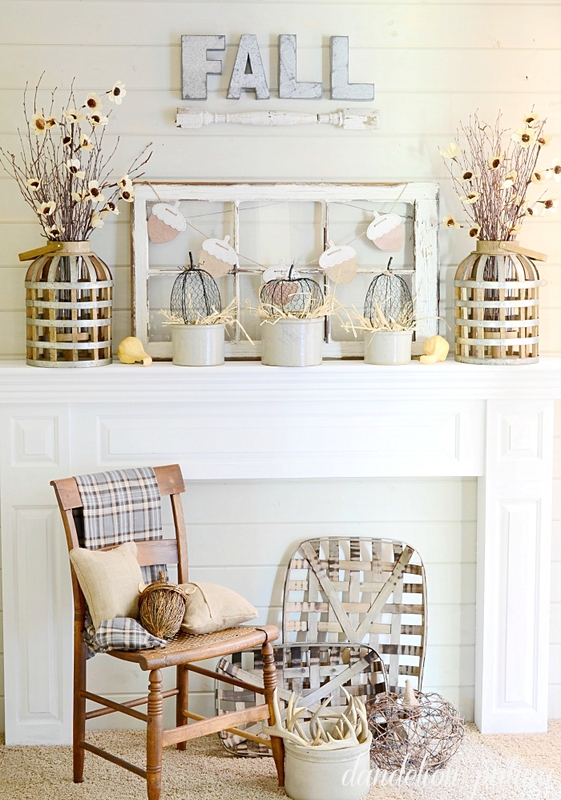 Mix faux leaves, candles and pinecones for an impressive late fall mantel. 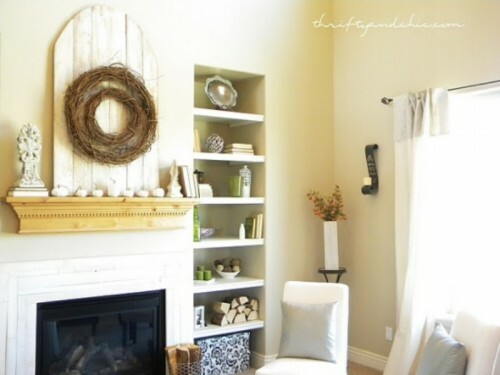 DIY twig wreath looks as great above your mantel as it looks on a front door. 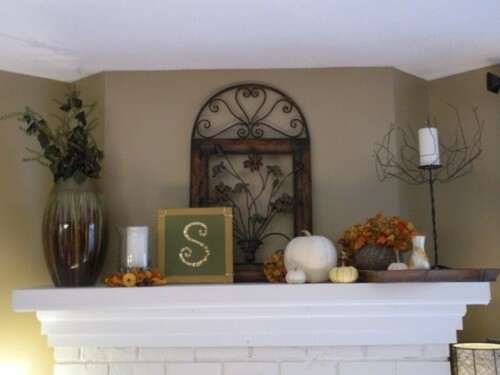 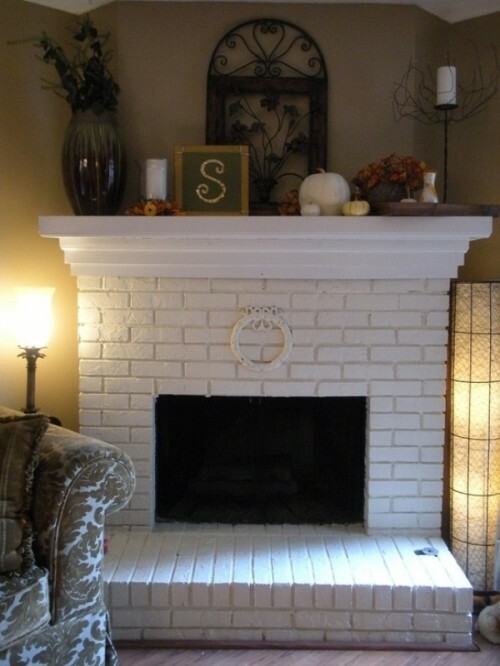 It's a cool idea to put your family's stamp on the mantel to prepare it for Thanksgiving. 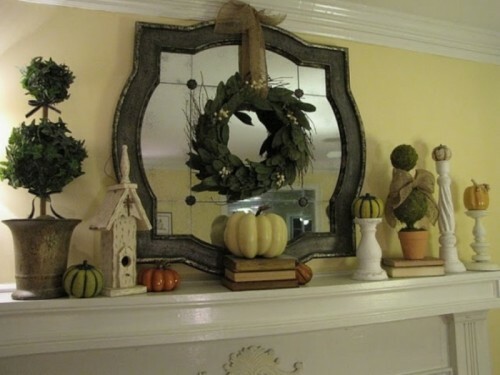 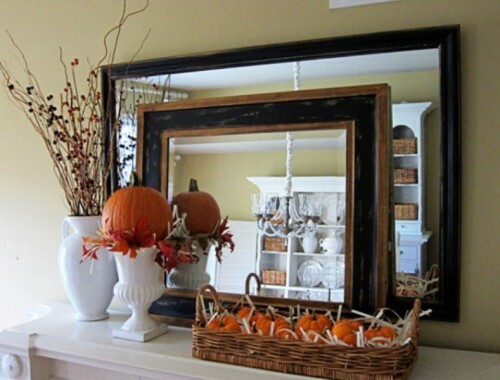 Hanging a wreath on a mirror is a quite interesting solution for fall mantel decor. 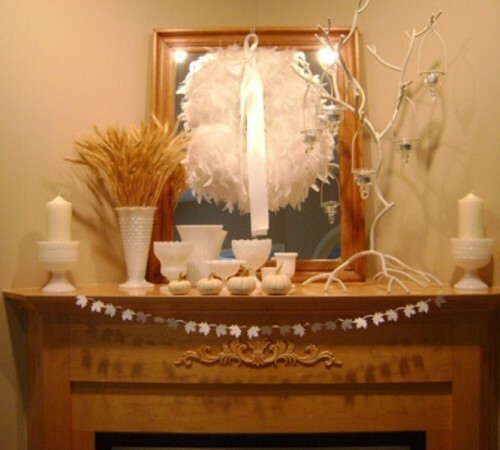 Adding some wheat steams in the vase is also a great idea to spice things up for the season. 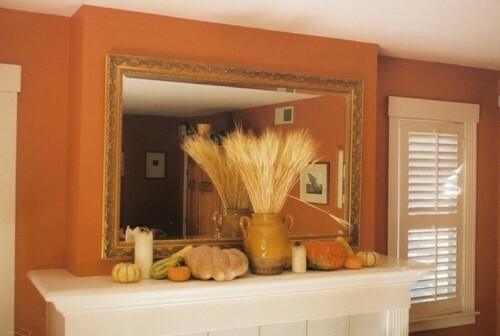 Dried wheat would become a centerpiece of any arrangement. 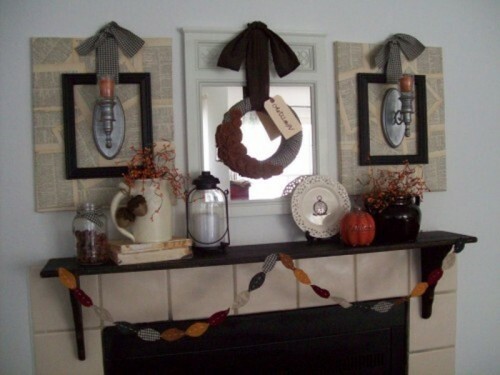 DIY burlap bunting is very easy to make but it'd add a very nice rustic touch to your mantel. 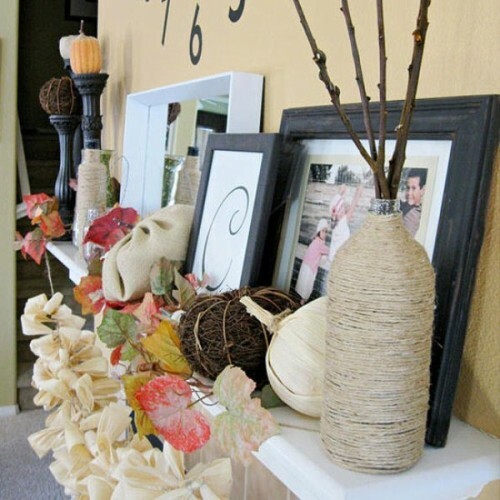 Cover your vases or even simple bottles with twine for a rustic fall look. 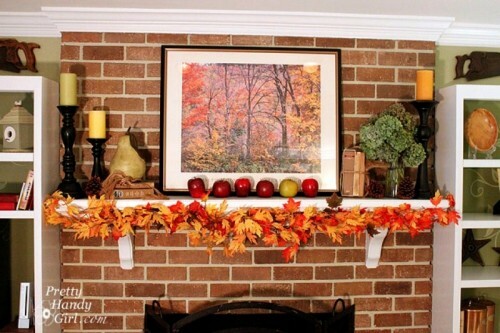 Hide christmas lights among faux leaves so you could light up your mantel any time. 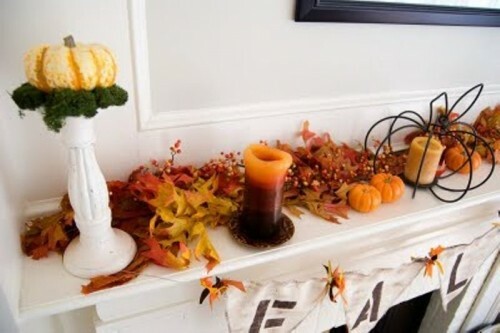 Even the simplest pumpkin arrangement would make a mantel looks seasonal and awesome. 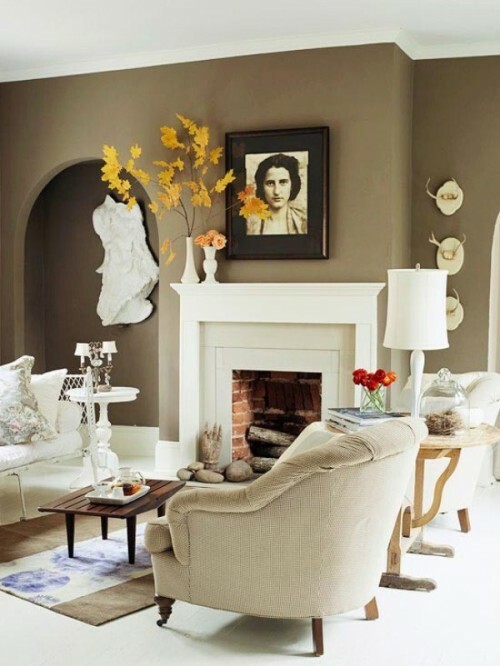 Although we'd recommend to use them in different colors and shades. 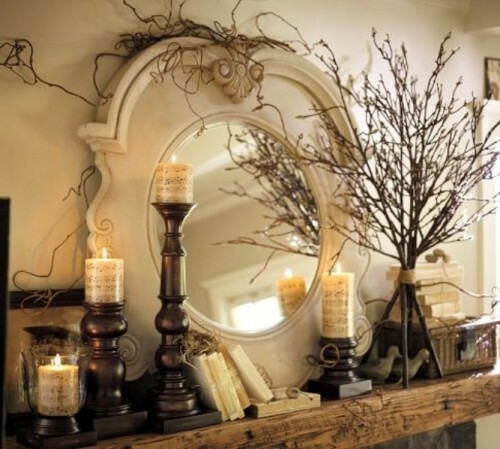 Dried twigs add dimension and they are the most easy solution for fall display. 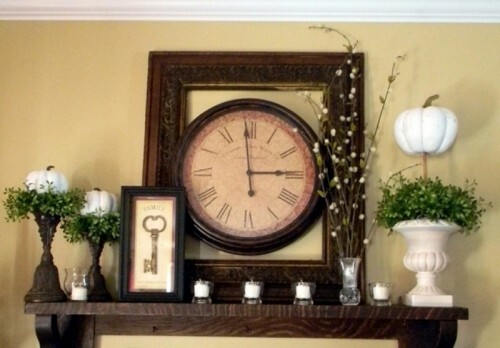 Layering things up is a great way to make a bigger impact with your decor. 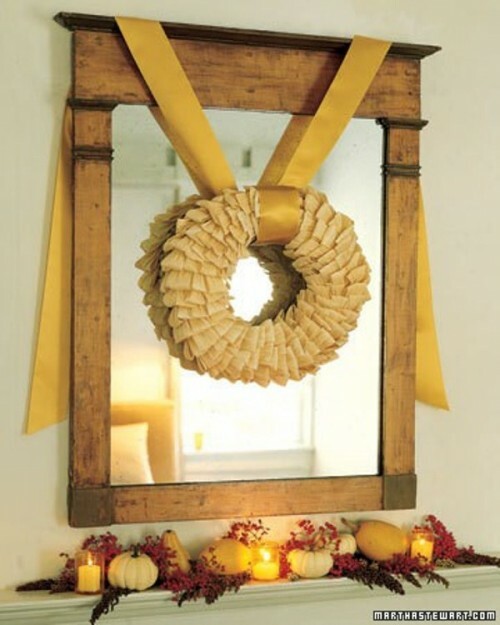 A mirror becomes a perfect backdrop for a wreath and other seasonal decor items. 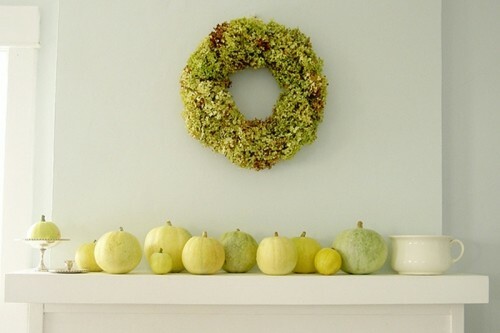 Even though moss wreaths are more popular for spring decorating you can use them in autumn too. 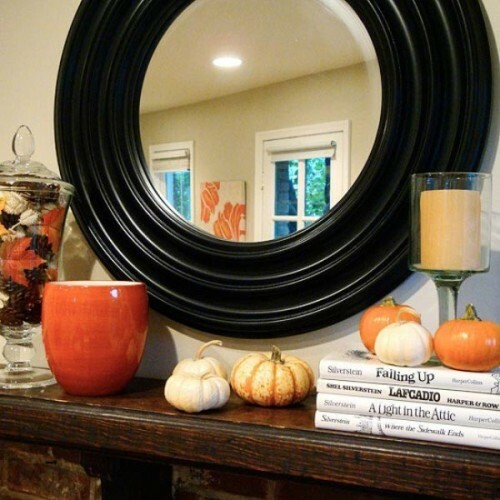 Combine a Halloween- and fall-themed decor for a more universal look. 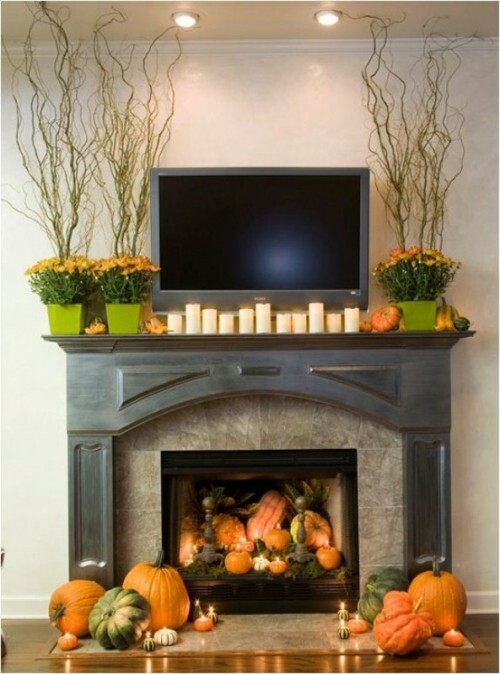 Even neutral shades could be festive and these chic gray pumpkins prove that. 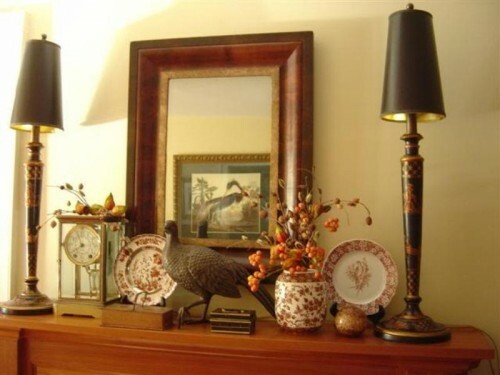 A tall vase brimming with tree branches and leaves adds height to the mantel. 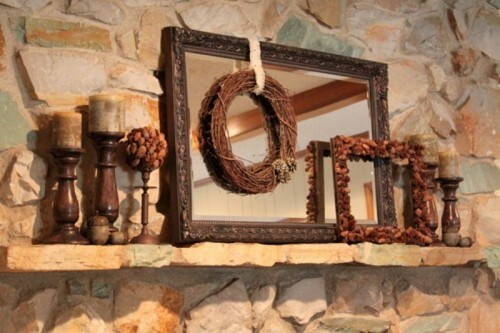 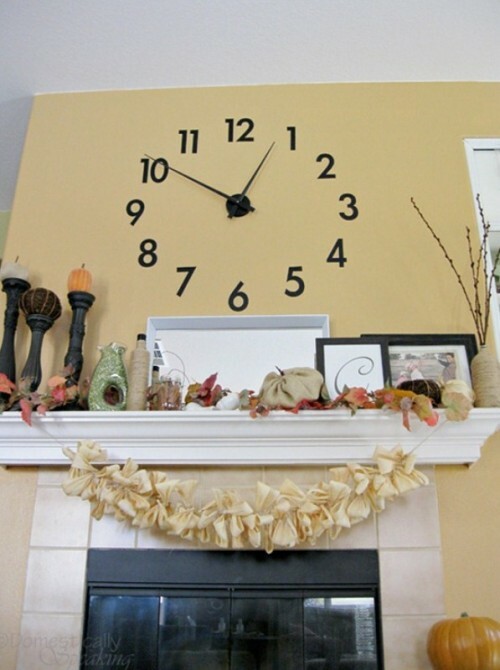 Dress up your mantel with a DIY burlap garland. 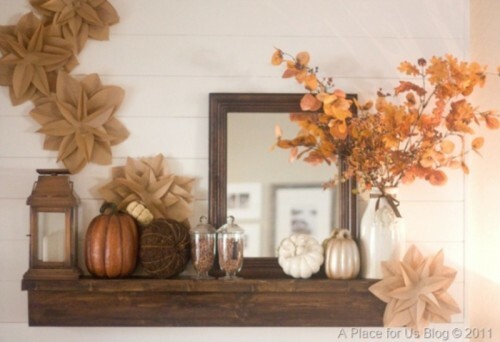 There are plenty of things you can make from faux leaves. 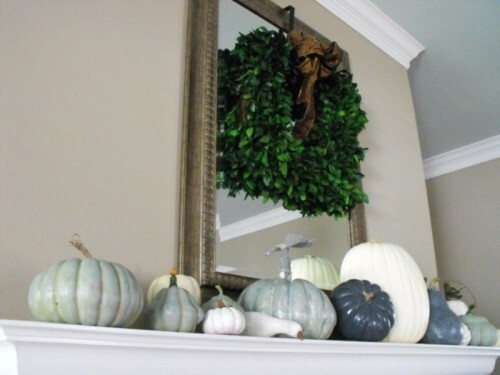 For example, a gorgeous garland. 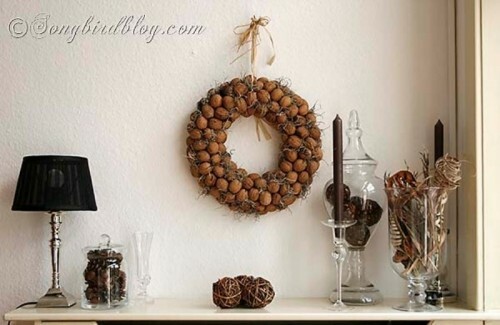 Making a nut or acorn wreath is one of those DIY projects that would definitely pay off. You can use it as outdoors as indoors. 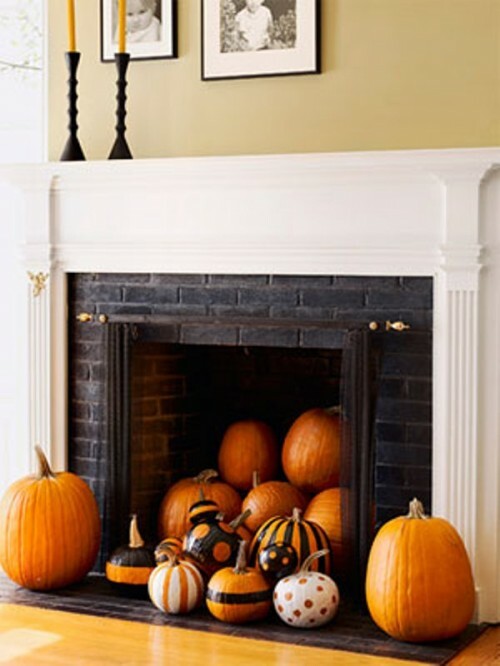 Tiny pumpkins are cute, right? 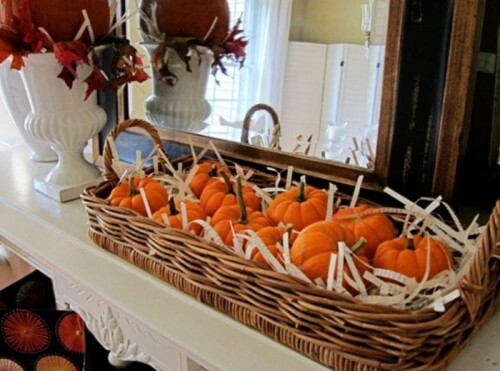 If you also think so, stuff a bunch of them in a woven tray and you got yourself a cool movable piece for fall decor. 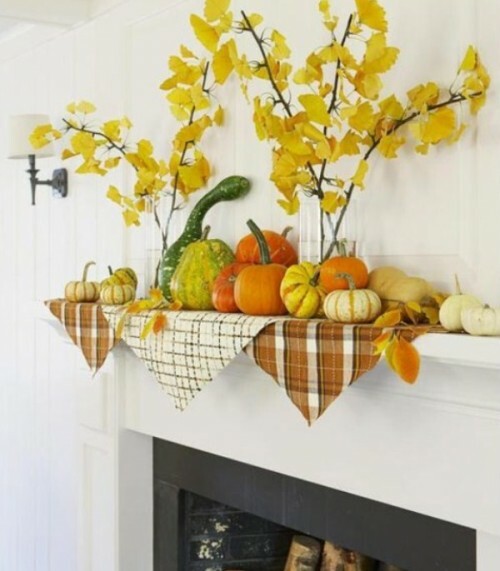 Fill several vases with corns, beans, pumpkins or other small products of autumn's harvest and arrange them on your mantel. 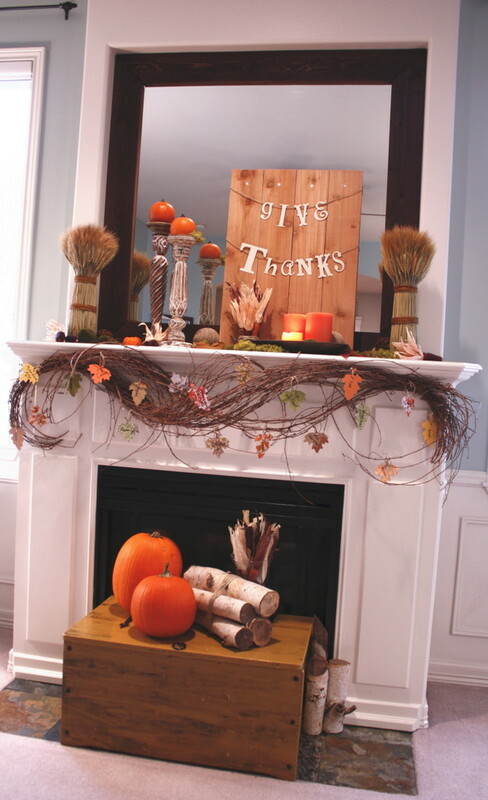 This simple display features small pumpkins along with a vase filled wth autumnal leaves and pinecones.